Known as the Ford Modular engine, this powerplant came in many models sold over many years. While a good engine overall, it does suffer from a chronic weakness resulting in an eventual, expensive repair. Much like GM's Vortech engine and its documented intake manifold issues, Ford V8's also have an Achilles heel. This issue is usually associated with coolant loss, performance loss, rough running of the engine, and over-heating issues. It can be very detrimental to the motor. 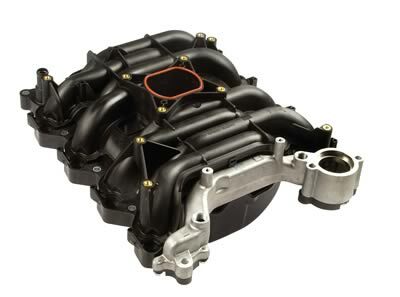 The issue appears to stem from the design of the intake manifold that uses plastic to route both coolant and air into and around the motor, while also serving as part of the bracing for the engine's alternator. Over the years the plastic manifold heats and cools many times, causing the plastic to become brittle and crack. Eventually, the load of the alternator being bolted to the manifold causes that brittle plastic manifold to finally crack enough to allow coolant to either exit outside the motor or enter into the vehicle's combustion chambers. While both situations are very bad, the coolant entering into the combustion chambers is especially bad as this can cause something known as "hydro-locking". The solution was the development of a better intake manifold using aluminum in place of plastic for the areas where coolant is routed through the system. HPMotors is familiar with this repair, and can test to ascertain whether or not this failure has occurred to your Ford. If you're experiencing any of the issues mentioned above give us a call to have your car tested.